Ezra loves to mow the lawn. He has loved it for as long as he’s been able to walk. It started off with a toy lawn-mower. Now, he’s moved up to the real thing. When the grass grows tall, the boy grows excited. He looks at me with confidence, “Daddy, the grass is reawwy long. I think I’m gonna mow now. Do you wanna mow with me?” He helps me open the garage door. He helps me clear rocks and sticks out of the way. He helps me pour gas in the mower. He primes it–one, two, three times. Then, he stands back and waits while I pull the cord (at least five or six times). Finally, it starts. I look up and wave him over. My favorite moment. 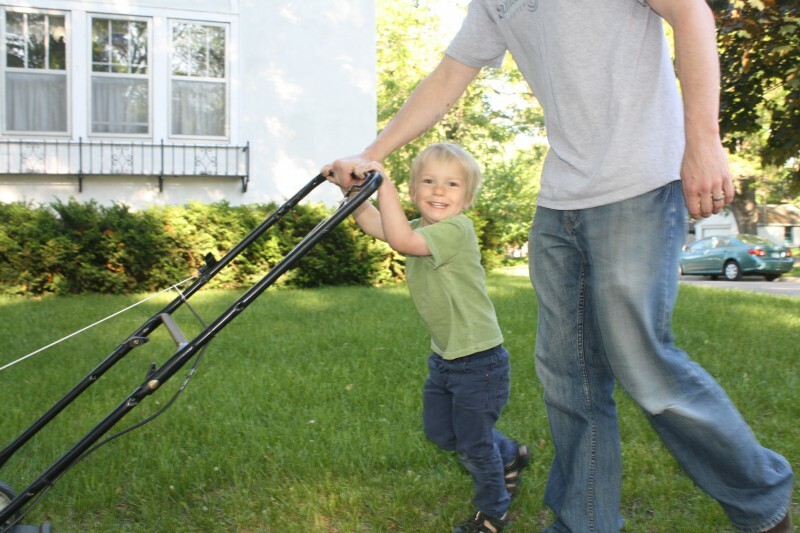 He smiles with anticipation and takes hold of the lawn mower with his Daddy. When I mow by myself, it usually takes about 20-25 minutes to finish ours and our neighbor’s lawns. When Ezra and I mow together, it takes around 45 minutes. There is no doubt in my mind that every single extra minute is worth it. I would not have it any other way. The other day I was humbled by the realization that God does not need me to complete his work any more than I need Ezra to mow the lawn. God is not served by human hands as though he needed anything. He is sufficient in his own being to accomplish all of his purposes. His work could go on without you and I. Yet, the Lord chooses to use human instruments. Look at the logic of Romans 10. A principle to take from Romans 10: Missionaries and those who send them are God’s ordained means for saving people who have not yet heard of the Lord Jesus Christ. This is a beautiful thing, even if the world does not receive it as such. Why does God do it this way? Wouldn’t it be cleaner and more efficient to use other means? Couldn’t he, in an instant, send angels to preach the Gospel to every single person alive today? Wouldn’t people take the message a bit more seriously from their mouths, instead of ours? Or, couldn’t God speak with an unmediated voice from heaven, as he has done before: “Jesus is my Beloved Son; listen to Him!”? I’m sure there are many true and good ways to answer those questions. Even as I write this, my mind is swirling with them. This is what hit me the other day: I want Ezra to mow the lawn, not because it’s clean and efficient, but precisely because it’s not. I want to be with him, as he works hard and grows stronger. One day, he will be a man. He will have to work hard for his family and his neighbors. Mowing the lawn is one avenue for nurturing those characteristics. On the flip side, Ezra loves to mow, because he wants to be like his Daddy. It gives him joy to do what his Daddy does, even as his Daddy does it with him. The work of missions is a bit like that. God seeks and saves the lost. He sent his Son to bring the nations to the obedience of faith, at great cost. Missions, then, is one aspect of imitating God–both going and sending. At least one of the reasons God chooses to use us is that he is conforming us into his image, because our God is a missionary God. He was not content to let the world go without the knowledge of his Son. Neither should we be content when billions go without Christ. There’s more. After Ezra and I finish the lawn, we reflect together. We love to talk about mowing almost as much as we love mowing itself, “Ezra, God gave you strength, and you worked really hard. You did a great job!” I want to give him the opportunity to experience Daddy’s good pleasure. He gets to hear, “Well done, Ezra.” I say this to him, even though I know he didn’t mow the lawn in his own strength. He could have never mowed without me there with him. But, that doesn’t take away from the fact that he actually mowed the lawn. I really am pleased with him, even though his presence actually makes my job more difficult. Ezra takes joy in mowing the lawn with his Daddy. That same joy is ours as we pursue the glory of Jesus Christ among the nations with our Father.